Prospective, randomised study with the objective of investigating if the probiotic Lactobacillus reuteri could improve symptoms in colicky infants. 90 breastfed infants, aged 11 to 80 days, and with confirmed infantile colic, were randomly assigned to two treatments: Lactobacillus reuteri ATCC 55730, 10^8 CFU/day and administered in an oil suspension, or simethicone, 60 mg/day. Eighty-three infants completed the study. The baseline median daily crying time was 197 minutes in both groups. After 7 days, crying time was significantly reduced in the probiotic group, 159 min/day, vs. 177 min/day in the simethicone group (P=0.005). 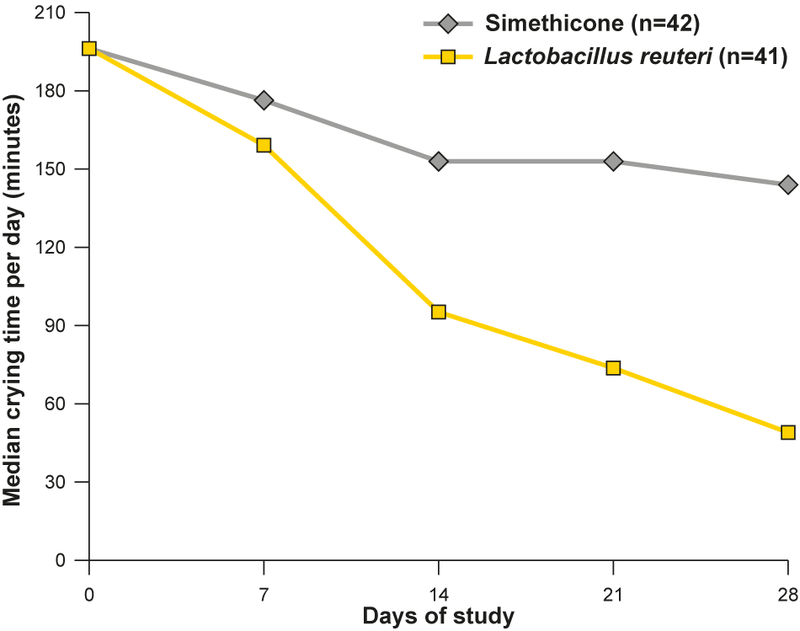 By day 28 the crying time in the Lactobacillus reuteri group was reduced to 51 min/day, vs. 145 min/day in the simethicone group (P <0.001). On day 28, 95% (39/41) were responders in the probiotic group and 7% (3/42) in the simethicone group. No side-effects were observed in either group. Conclusion: The intake of Lactobacillus reuteri resulted in significantly less crying time within one week of treatment compared to standard therapy in these infants. This effect was even more pronounced at the end of the 4-week study. Savino F, Pelle E, Palumeri E, Oggero R, Miniero R. Lactobacillus reuteri (American Type Culture Collection strain ATCC 55730) versus simethicone in the treatment of infantile colic: a prospective randomised study. Pediatrics 2007;119:124-130.